Published: May 2, 2016 at 08:41 p.m. 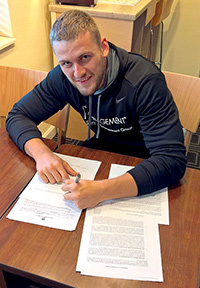 Updated: May 2, 2016 at 09:16 p.m.
Moritz Boehringer didn't waste any time putting pen to paper. Boehringer, the German wide receiver who became the first player to be drafted out of European league straight to the NFL, signed a contract with the Minnesota Vikings on Monday. Boehringer, selected in the sixth round (180th overall), is the first rookie from the NFL's 2016 draft class to sign a deal. There's a good reason for it. Boehringer must show proof of employment to obtain a work visa in the United States. Signing his contract puts the wheels in motion on what could be a protracted paperwork process. Boehringer was the biggest story of the final day of the draft. The 22-year-old German Football League star became interested in football as a teenager after watching a YouTube clip of Adrian Peterson. He adopted the Vikings as his favorite team and now gets the chance to play for them. It's a modern-day märchen.